Characterization of protein deposition in vivo and ex vivo. Chapter 12: An efficient protein transformation protocol for introducing prions into yeast. Chapter 13: Screening for genetic modifiers of amyloid toxicity in yeast. Chapter 14: Searching for anti-prion compounds: Cell-based high-throughput in vitro assays and animal testing strategies. Chapter 15: A Drosophila Model of Alzheimer’s Disease. Chapter 16: A C. elegans model of polyglutamine disease. The ability of polypeptides to form alternatively folded, polymeric structures such as amyloids and related aggregates is being increasingly recognized as a major new frontier in protein research. 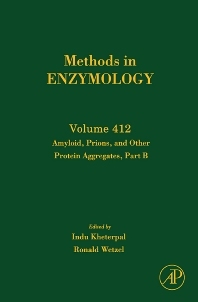 This new volume of Methods in Enzymology along with Part C (volume 413) on Amyloid, Prions and other Protein Aggregates continue in the tradition of the first volume (309) in containing detailed protocols and methodological insights, provided by leaders in the field, into the latest methods for investigating the structures, mechanisms of formation, and biological activities of this important class of protein assemblies. Biochemists, cell biologists, neuroscientists, and related fields engaged in protein research. University of Tennessee Medical Center, Knoxville, U.S.A.